This is not a book review. This is a letter to thank you for writing one of the most brilliant books to ever grace the literary world. 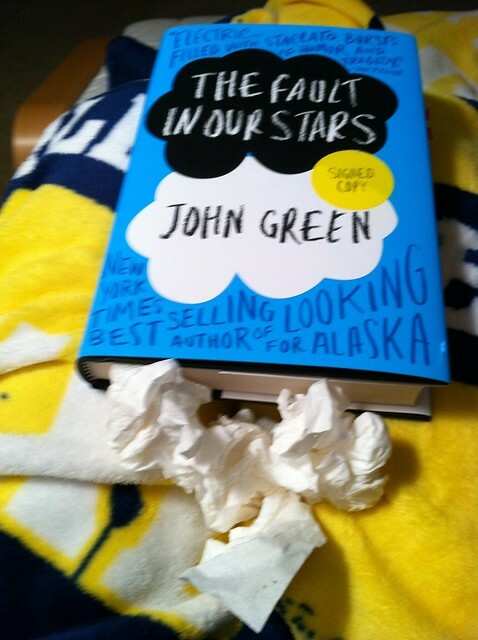 I spent the entire day reading The Fault in Our Stars yesterday. I never do that. I don't have time anymore. I read upwards of 100 books a year, but it is done so in little pockets of time: listening to audiobooks while I cook dinner, reading as a passenger in the car while my husband drives us to Home Depot, finding a miniscule moment of time in my hectic day as a teacher to sit down at my desk and read a few pages while my students are taking a test. So when I started to read the first pages of Hazel and Augustus's story on Friday evening, I wanted to stay up all night: I was that sucked into their world. But alas, my body does not allow me to stay up all night anymore, so upon awakening Saturday morning, I continued with their story. I did not move from my chair until I finished. I don't even know how to express my feelings in words. Hazel and Augustus were real people to me. They were two of the most wonderful teenagers ever to have graced this planet, even if only in the pages of a book. So as their tragic story unfolded, I grieved for them, as I'm sure you did as you wrote their story. As I sat there reading, a pile of sodden tissues in my lap, my thoughts ping-ponged between sadness and joy. Conversations that were supposed to be tragic ended up making me laugh out loud at their light-heartedness and humor. Scenes that would have been cliche and caused me to roll my eyes in any other book made me weep at their tenderness and romanticism. I planned to write a review for this book. I marked pages. I wrote notes. But the closer to end I crept, the more I realized that this book can't be reviewed. It can't be intellectualized. It must merely be felt. Don't get me wrong, there are so many great moments worthy of discussion in any book club or literature class, but to sit here, only 24 hours after turning the final page? All I can do is marvel. In my 32 years on this earth, I have yet to declare one favorite book. When people ask, my students especially, what my favorite book is, I always tell them, "I have lots of favorites. I can't choose just one." Today and from here on out, whenever anyone asks me what my favorite book is, I can tell them, beyond a shadow of a doubt, that it is The Fault in Our Stars. So thank you John Green. Thank you for Hazel and Augustus and Isaac and for all of the other amazing characters to grace this brilliant story. When I turned the last page yesterday, I grieved. Not just for the characters and for the end of the book, but also for the fact that I don't know if any book I read from here on out will ever live up to this one. You have made my reading life from this day forward a much more challenging endeavor. So thank you for that. LOVE your post. I'm now kicking myself for not buying this book while I was at Barnes and Noble today! Dang it! Wow...really can't wait to read it now! It's so grief-laden I'm not sure I can read it. I know it's supposed to be brilliant but I had a hard time with "A heartbreaking work of staggering genius" and this makes that look like an emotional cakewalk. Can't wait until tomorrow, when you share this book with me! Wow, I've been so scared to read this, but maybe I need to bite the bullet and dive in! Don't be scared! Yes, the book is sad, but it's worth it. The humor and tenderness within the sadness is just brilliant. This is so wonderful. I can't wait to read it. Thanks for sharing this with me. Can't wait to read it. Have to finish Paper Towns first. Just gave my daughter her first lesson in annagramming. Such a beautiful book, right? Thanks for visiting my site and entering my giveaway! I'm looking forward to reading more from you! I'm always on the lookout for a new book. I prefer when people suggest them to me rather than pick them out myself because I can never make up my mine. Thanks for the recommendation.